My work background is in holistic health and beauty. In 1987, I set forth my knowledge and desire to care and nurture human beings. Years later, I found the Koelle Institute. The amazing team of people and horses, helped me flourish by teaching me coaching techniques that compliment my work. This combination of self care and permission to find connection within yourself through a horse is a visceral and revealing experience. The invitation to truth that horses give us is a TRUE gift. Growing up in the mountains of CO, this gift was given to me everyday by my four-legged friends. 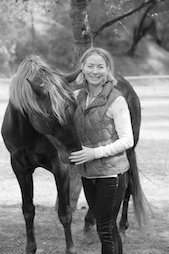 I now offer you the invitation to step into an amazing Equus Coaching experience! I hope to meet you soon! Consultations are complimentary.